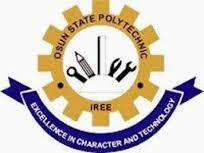 Osun State Polytechnic, Iree (OSPOLY), Higher National Diploma (HND) Acceptance Fee, Payment Guidelines and Procedures for 2018/2019 Academic Session. All candidates successfully admitted into the various Osun State Polytechnic, Iree (OSPOLY), Higher National Diploma (HND) programmes are hereby informed to proceed with the acceptance of their admission and payment of acceptance fee for 2018/2019 academic session. All the candidates offered admission are to proceed to the Ospoly Microfinance Bank, Iree or its branches at Ayetoro, Osogbo or Isokun round about, Ilesa to buy Acceptance Card of N15,000 to print necessary documents online preparatory to pre-registration screening at the admission office. Click Here to Proceed with the Acceptance of admission offer.